SCVHistory.com | Newhall-Downtown | 1876: Southern Pacific Tunnels Through. 1876: Southern Pacific Tunnels Through. Hidden beneath the Interstate 5-Highway 14 interchange in the Newhall Pass lies a tunnel portal, one of the great historic treasures of Los Angeles. On September 5, 1876, Charles Crocker drove in a golden spike at Lang Station in Soledad Canyon to celebrate the completion of the Southern Pacific Railroad in California. This monumental day would not have been possible were it not for the completion of the San Fernando Railroad Tunnel by a crew of about 1,000 Chinese workers (and 500 others) in the summer of 1876. After the completion of the Transcontinental Railroad linking California with the eastern half of the United States on May 10, 1869, the "Big Four" entrepreneurs of the Central Pacific Railroad — Crocker, Leland Stanford, Mark Hopkins, and Collis Huntington — set their sights on connecting Northern and Southern California via the Southern Pacific Railroad. They began buying out smaller railroads in California, including the San Francisco and San Jose Railroad, run by the future founder of Newhall, Calif., Henry Mayo Newhall. The railroad builders decided on a route stretching from San Francisco south through California's Central Valley, then penetrating the Tehachapi mountains through the Tehachapi Pass (in which they built the famous Tehachapi Loop), then south through the Mojave Desert passing through what are now the town of Mojave and the cities of Lancaster and Palmdale, and then threading through Soledad Canyon into the Santa Clarita Valley. To the south of Santa Clarita, the plan was to build a line from Yuma, Ariz., on the Colorado River through the desert and into the San Gorgonio Pass, then passing along the southern edge of the San Gabriel mountains into Los Angeles and the San Fernando Valley. Another branch line was to be built connecting to Anaheim and San Diego. One great challenge remained. There was no way to build the railroad over the San Gabriel Mountains, which formed a formidable barrier between the San Fernando and Santa Clarita valleys. Hence was hatched a plan to bore a tunnel through the mountains under the San Fernando (or Fremont) Pass, where the mountain range dipped to its lowest point before joining with the Santa Susana Mountains to the west. Prior to this time, the only way to get across these mountains was at Beale's Cut, constructed by Edward F. Beale in 1863. The Big Four had originally planned to bypass Los Angeles altogether. The city had a small railroad built by Phineas Banning in 1869 connecting Los Angeles with the harbor at San Pedro. The citizens of Los Angeles had higher aspirations and desired to connect their 21-mile railroad with the rest of the country. In July 1872, former California Gov. John G. Downey sat down with Stanford and Crocker and worked out a deal to bring the Southern Pacific into Los Angeles. The Southern Pacific would, in exchange, get ownership of the Los Angeles & San Pedro Railroad, with rights of way to extend the line to Anaheim and Pomona. By 1874, that railroad was extended to the new town of San Fernando. 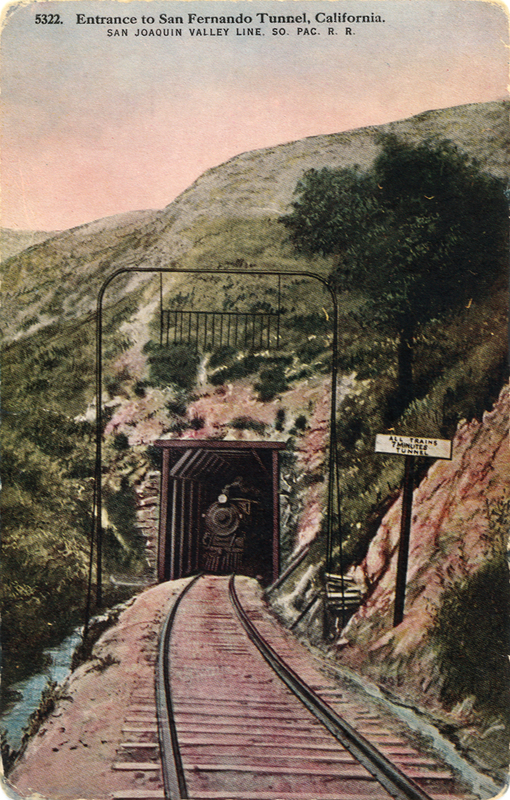 Work began on the San Fernando Railroad Tunnel on March 22, 1875. 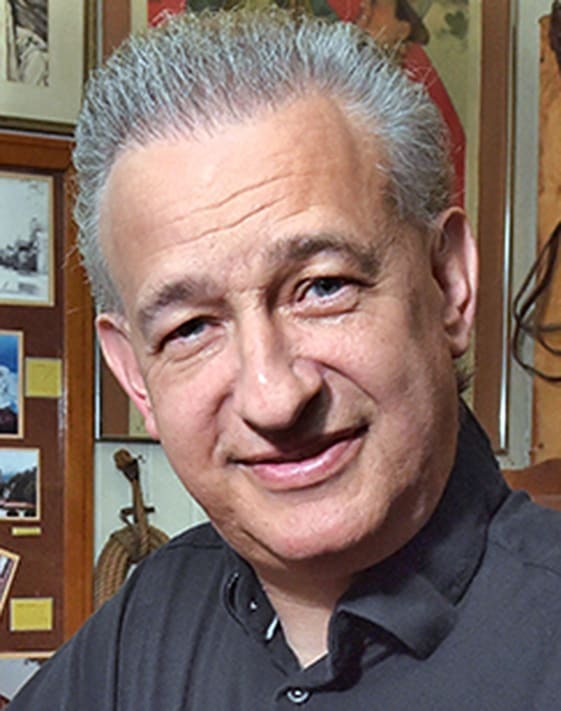 Former Central Pacific Railroad worker Frank Frates was chosen to supervise some 1,000 Chinese and 500 white laborers in constructing the tunnel. "Frates' excavation was 22 feet high, 16½ feet wide at the bottom and over 18 feet at the shoulders, an angular arch being formed overhead. The Chinese worked as teams of two, one man holding the wedge in place against the rock while his partner swung the heavy sledge. The upper half of the tunnel was dug in advance of the bottom half for a distance of about 20 feet. Temporary timbers were placed as soon as the excavations were made; permanent timbers of Oregon cedar would be placed later. The lower half of the tunnel was dug by another crew of workers, the dirt being carried away by two-horse cars running on laid track. Day and night the work went on in 8-hour shifts, the Chinese being paid $1.00 per day and the white carpenters and mechanics receiving $2.60 a day for a 12-hour shift. A city of tents was located near the south end of the tunnel mouth for the workers." Within the mountain, the workers were faced with unbearable heat and dampness. Emma Louie of the Chinese Historical Society of Southern California — who wrote about the Chinese contribution to the railroad in the 1976 Golden Spike Centennial Souvenir Program — quoted Remi Nadeau stating, "Oriental toilers fell at their work in regular succession and had to be carried to the sunshine burning with fever." Originally estimated to take two years to complete, work was begun at both the north and south ends of the tunnel. To help expedite the enormous task, surveyors determined a spot at the summit of the mountain from which a vertical shaft was dug to meet with the center of the tunnel. This allowed waste rock to be hauled out of the tunnel by means of a large cable drum and hoisting engine built in Sacramento. The tunnel actually took just over a year to complete. Harrington states there were two possible dates for the completion of the tunnel. The first version has Chinese diggers coming face to face July 14, 1876, with the opening of the tunnel just one-half inch out of line. Another version has Frates himself completing the tunnel in August 1876, removing the last cart of earth with his own hands. At any rate, the first train passed through this miraculous, 6,966.5-foot tunnel August 12, 1876. At the time of completion, it was the third longest tunnel in the United States and fourth longest in the world. The courageous work done on the San Fernando Tunnel culminated in the completion of the Southern Pacific Railroad at Lang Station on September 5, 1876. A Golden Spike ceremony took place that day as the last tracks were laid. "Clad in basket hats, blue denim jackets and trousers, and cotton sandals, stood along either side of the mounded right-of-way. Four thousand strong, they lined the roadbed in military file, leaning on their long-handled shovels, ‘lie an army at rest after a well-fought battle." "Greetings have been interchanged between the delegations from the two cities; the General Manager of the Atlantic and Pacific Telegraph line has established an office and has wires connected to Los Angeles and San Francisco. At last all is readiness and the signal is given. Amid loud cheers the track-layers pursue their labors. Frank Frates, a well known Central Pacific workman, has charge of the Southern gang of workmen, and when his men won the race, laying the road in five minutes, the cheers are loud and prolonged; the last rail is laid; the spike is of gold, beautifully inscribed; the hammer of silver..."